Can you supply another photo much closer up of the writing underneath. There is too much glare on the lower right hand characters to be legible enough. At a quick look though it appears to be Japanese Meiji period, which would put it between 1868-1912. An enamelled Imari/Kutani vase. Two different jugs? Handle on right, bird scenes are not the same...therefore you have 2 different pitchers. Same colors, style, design, different scene...even the background looks the same, different colors (flash) same texture. The example I provided was just for reference. Michael said Katani and this one was Katani, with many similarities. 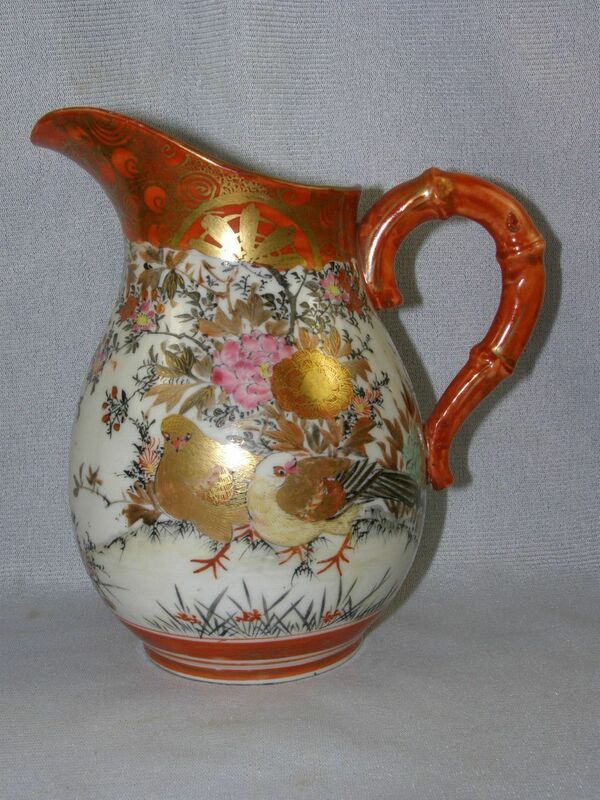 www.Gotheborg.com shows other porcelain wares in same colors, bird scenes, style as yours. In link, find #475, 685, 484 and 485. They're altogether. Indicates they are Kutani, 7 Valleys (there are other Kutani locations) circa 1880 to 1900. Oops, I said Kutani 7 Valleys. Meant to say 9 Valleys.